After the release Samsung Galaxy S3, it has taken over Apple iPhone's market dominance. Now with the release of the Samsung Galaxy Note last Thursday, they are hoping to have the same fate to have dominance in the tablet market. Let's take a glimpse of the Samsung Galaxy Note tablet that comes with a a stylus-type pen and split-screen function. 1) Samsung Galaxy Note can have two active apps on a split screen. 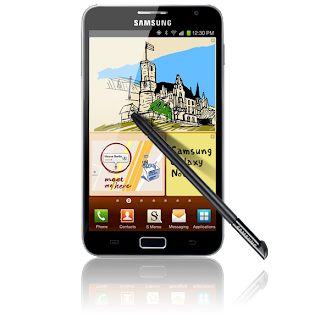 2) The S-Pen allows the user to write and sketch on the screen. 3) Galaxy Note comes in a quad-core processor with 1.4 GHz clock speed, a 5 megapixel rear camera and 1.9 megapixel front-facing camera. Just like Samsung Galaxy S3, it can detect eye movement, which prevents the device to go standby mode. 4) Note 10.1 tablets are powered by Google's latest generation Android software. Samsung Galaxy Note 16GB sells at $499 the same price as the iPad while the 32GB model sells at $549, only $50 less than iPad 32GB. Will techies select the Samsung Galaxy Note or stick to the loved iPad?